I am feeling incredibly blessed today! I just gave our youngest an old sketchbook of mine - a big 14x20" hardcover that I thought I'd like but never ended up using - I've had it for years and since she was wanting to have some BIG paper to make some BIG art, I happily passed it on! After receiving it, she created a list of supplies she would be needing to fulfill her new creative endeavours: an easel, a pencil and eraser, and some markers. We gathered all the supplies and then she turned and said, "I'm headed outside to work in the yard, are you coming?" 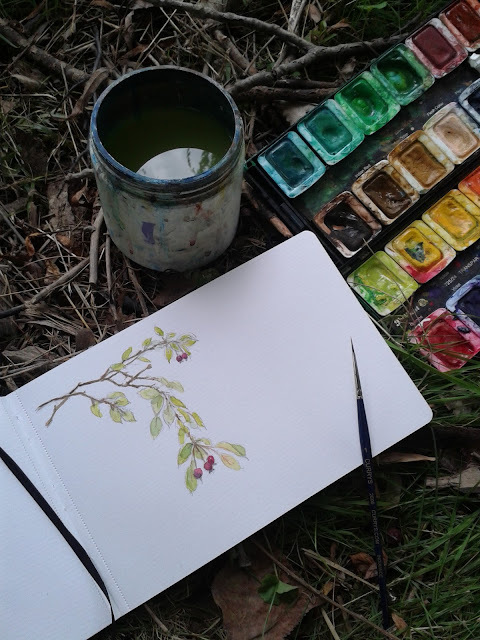 I thought for a moment, then grabbed up my new travel-size watercolour pad, my paint box, selected some of my friendliest brushes, filled my water pot with some fresh water and followed her outside. Several times during the next two hours of drawing and painting en plein air with my daughter I paused and thanked God for the wonderful blessings He was blessing me with: eyesight to see the gorgeous colours around me, an ability to capture some of the beauty, and this wonderful time shared with my daughter as we explore our interests in art. I looked up from the painting I was working on and watched my daughter as she worked away at her design. She would sketch a few lines, then step back to look at her work... I couldn't help but smile when I noticed that she tilts her head just like I do when I'm considering something - I guess it's our way of giving ourselves a new perspective! I worked a bit more on my painting and then quietly said, "You know, God has blessed me through you today! 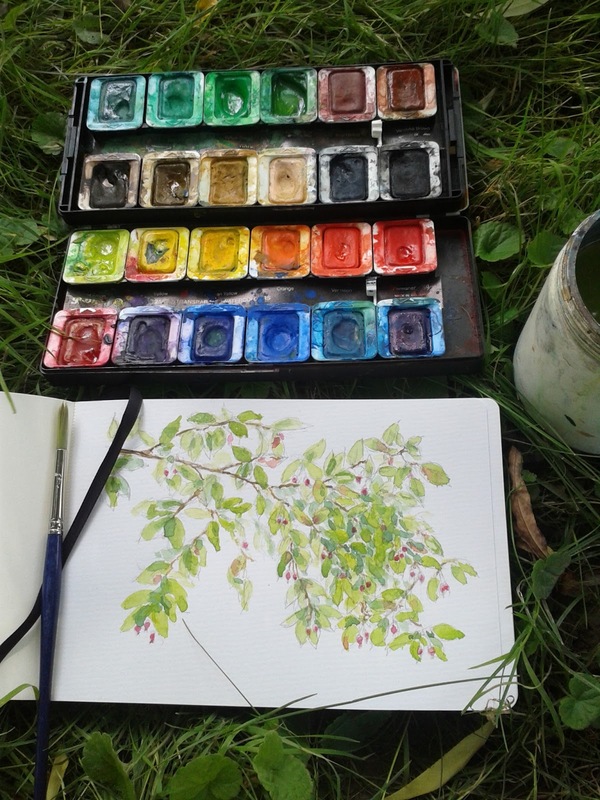 I never would have thought of coming out here this afternoon but you asked me to join you and I'm having a lovely time sitting here with you and painting! Thank you!!" A smile grew on her face and she stepped over to me, gave me a quick hug, then went back to work on her design. A moment later she said, "I'm having fun too!" You've blessed my day by sharing your happy blessings....and your lovely, grateful perspective that allowed you to see, appreciate and share those blessings with us!! I can just see you two painting together!! I love it!! These are golden days that you'll cheriush forever! !